 Melting  Evaporation  Freezing  Condensation. 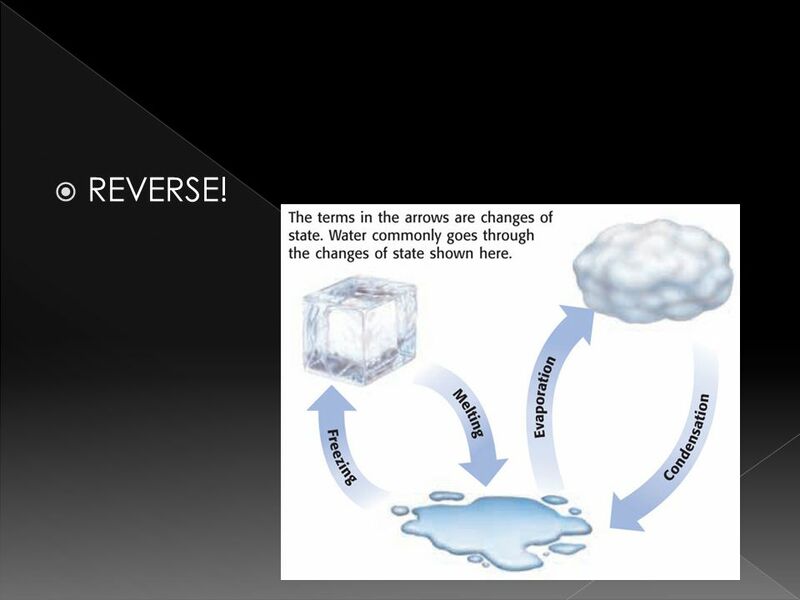 4  A change of state is changing a substance from one physical form to another.  Physical change means the substance only changes it’s appearance; it’s still the same substance! 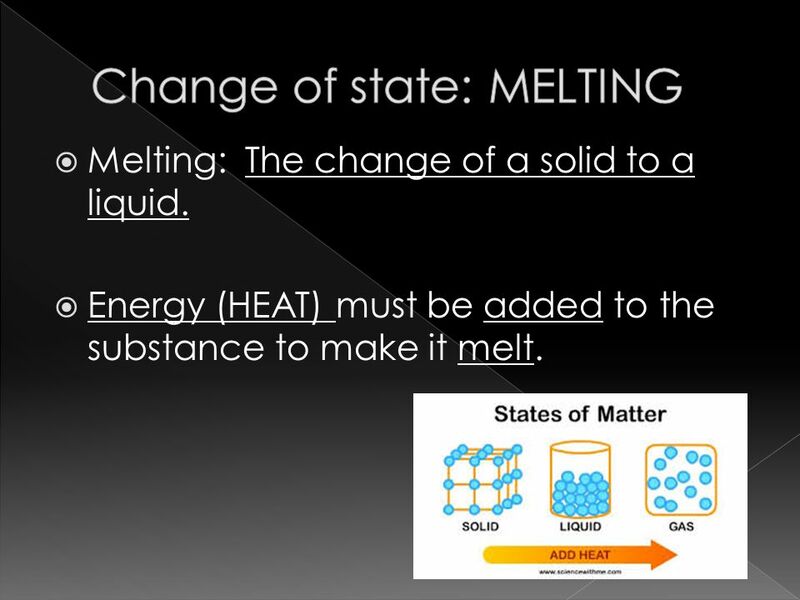 8  Melting: The change of a solid to a liquid. 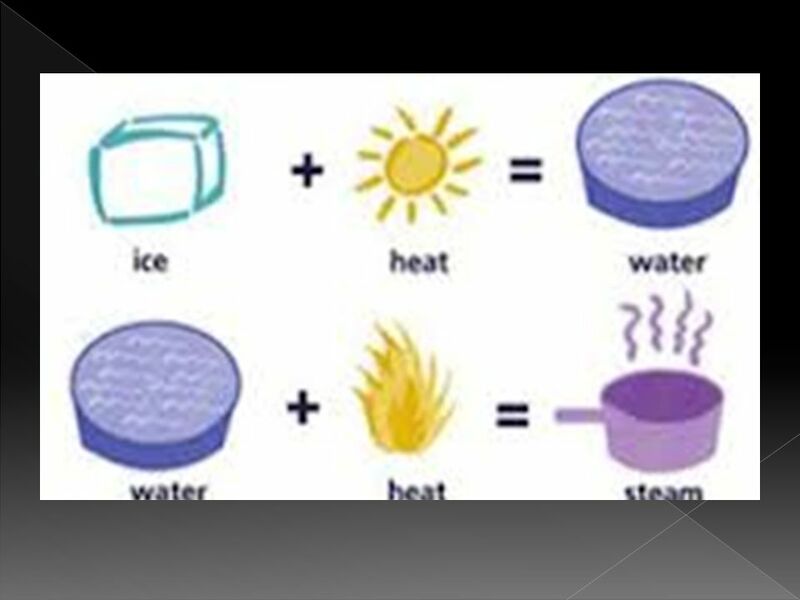  Energy (HEAT) must be added to the substance to make it melt. 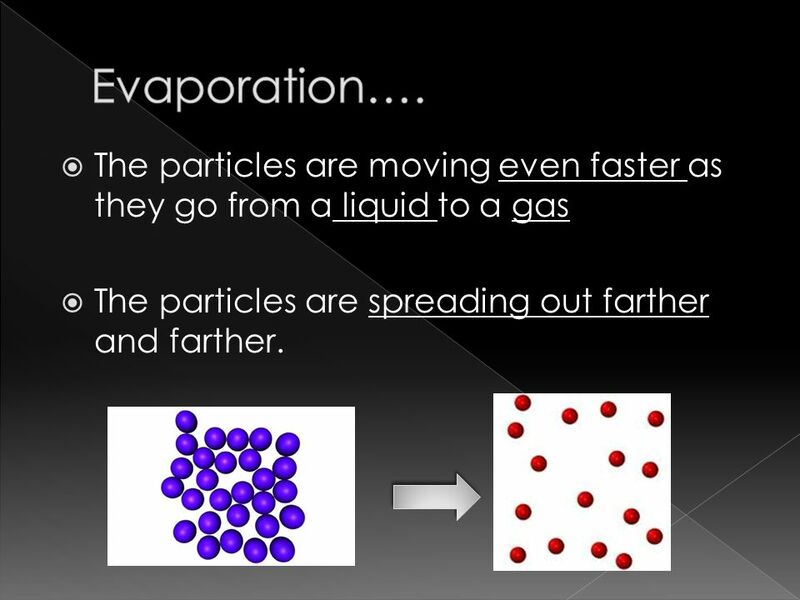 11  The particles are moving even faster as they go from a liquid to a gas  The particles are spreading out farther and farther. 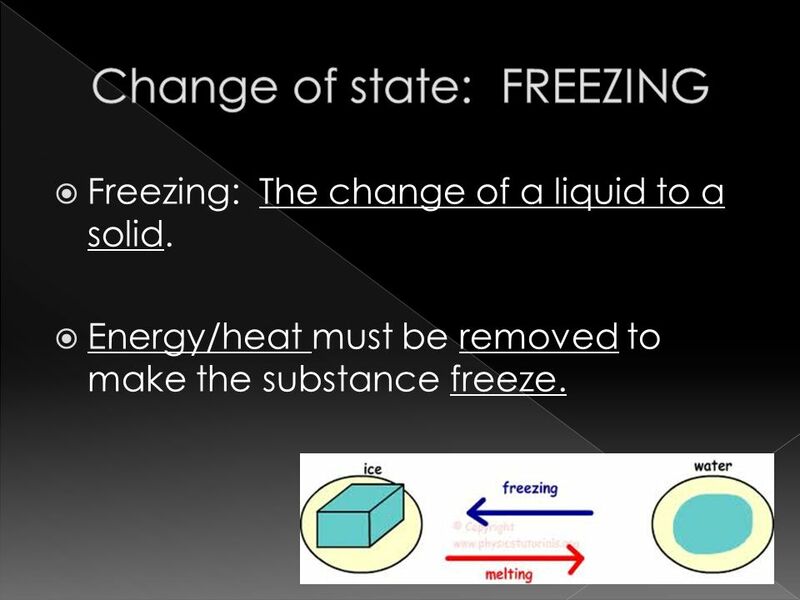 14  Freezing: The change of a liquid to a solid. 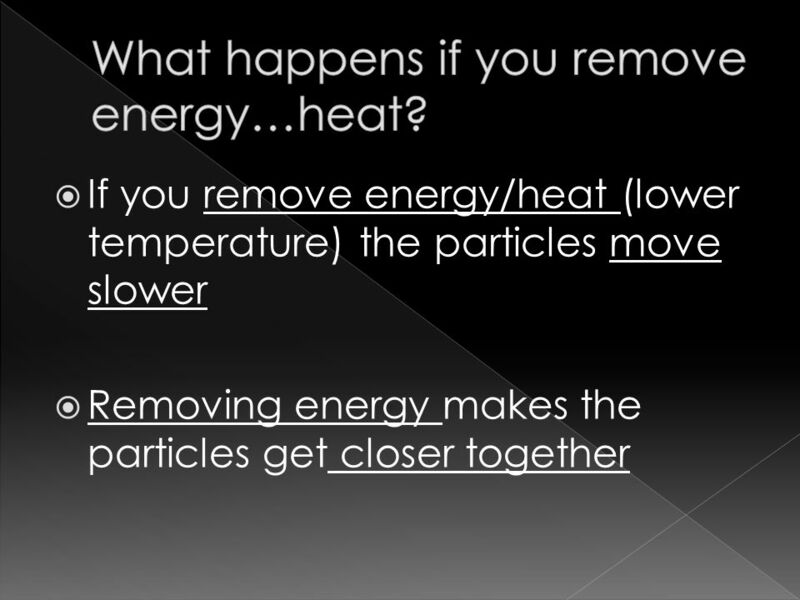  Energy/heat must be removed to make the substance freeze. 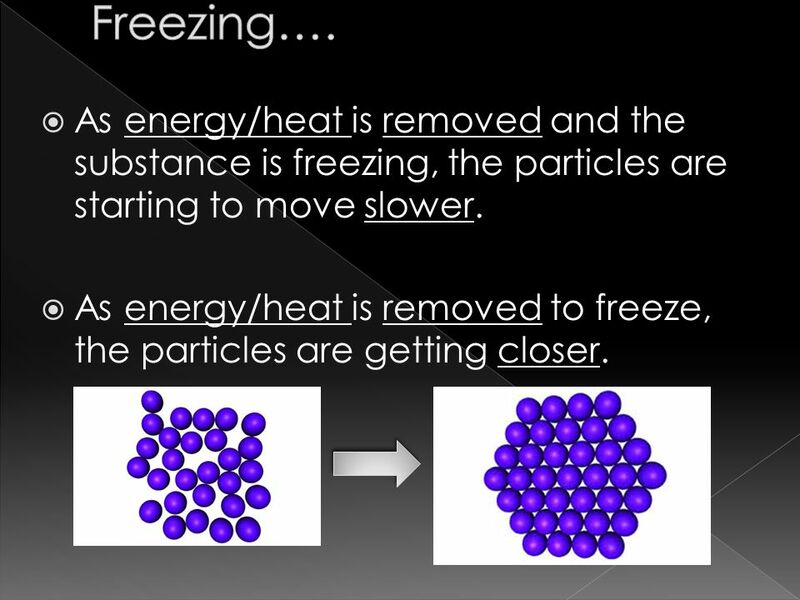 15  As energy/heat is removed and the substance is freezing, the particles are starting to move slower. 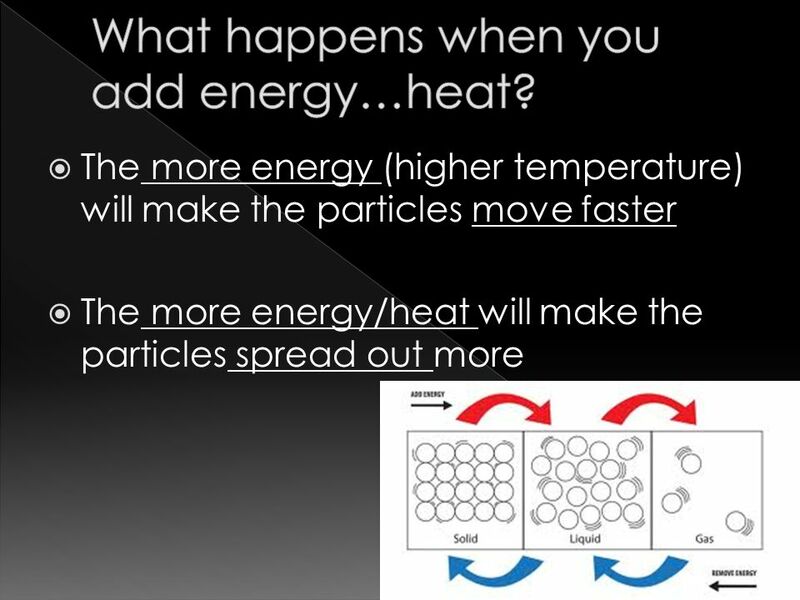  As energy/heat is removed to freeze, the particles are getting closer. 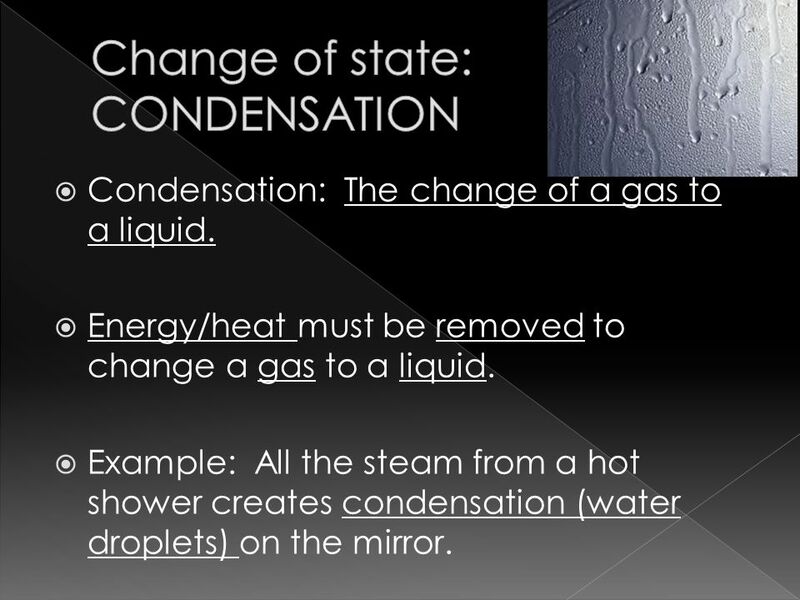 16  Condensation: The change of a gas to a liquid. 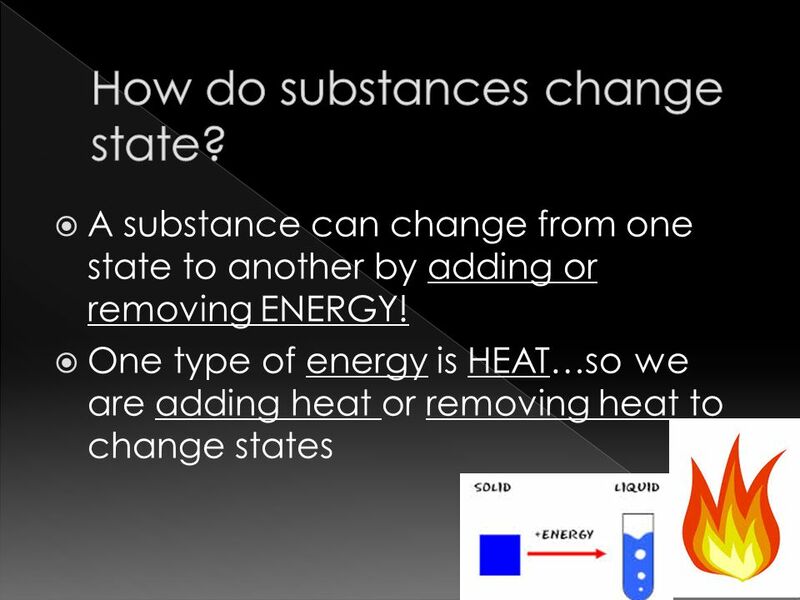  Energy/heat must be removed to change a gas to a liquid.  Example: All the steam from a hot shower creates condensation (water droplets) on the mirror. 17  As energy/heat is removed in condensation, particles are moving slower. 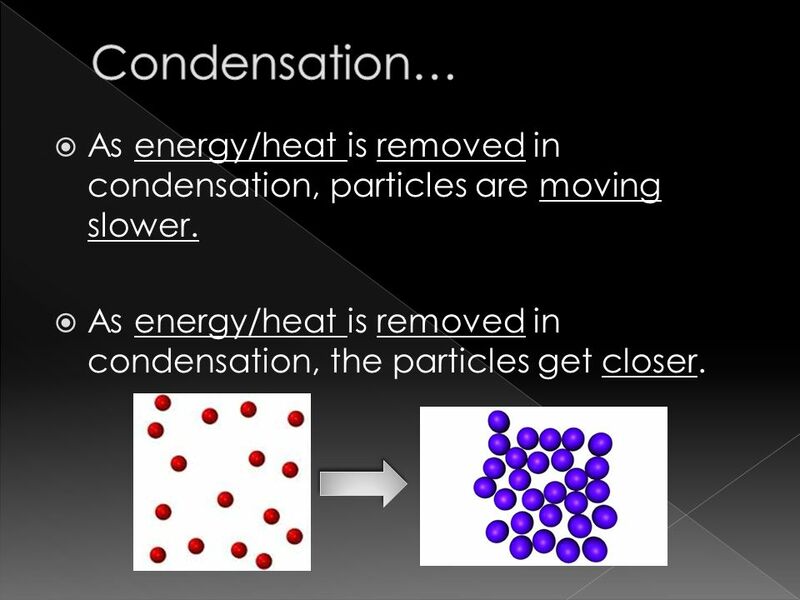  As energy/heat is removed in condensation, the particles get closer. Download ppt " Melting  Evaporation  Freezing  Condensation." Changes of State Beta Science. Kinetic Energy and Phase Changes. Diffusion Diffusion is the process by which molecules will move randomly in order to fill the space that they are in. 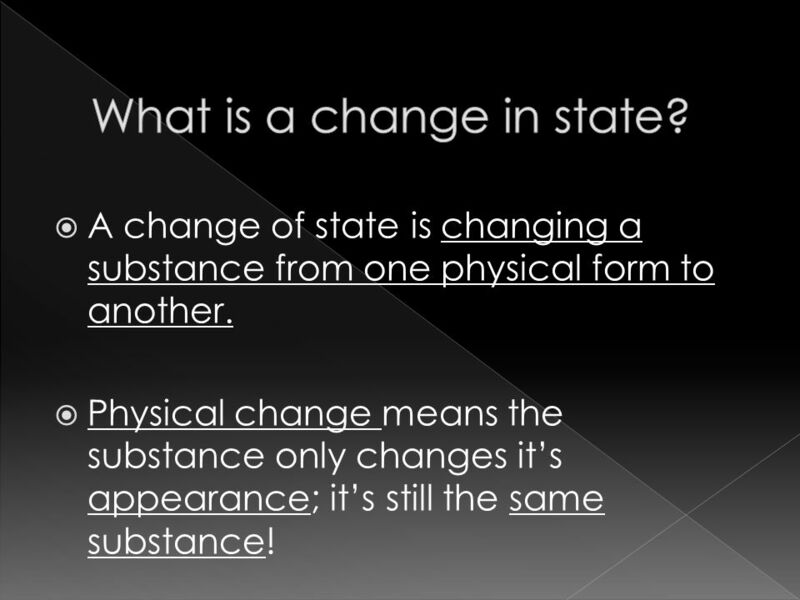 Change of State Change of state is the change of a substance from one physical form to another. ALL CHANGES OF STATE ARE PHYSICAL CHANGES. 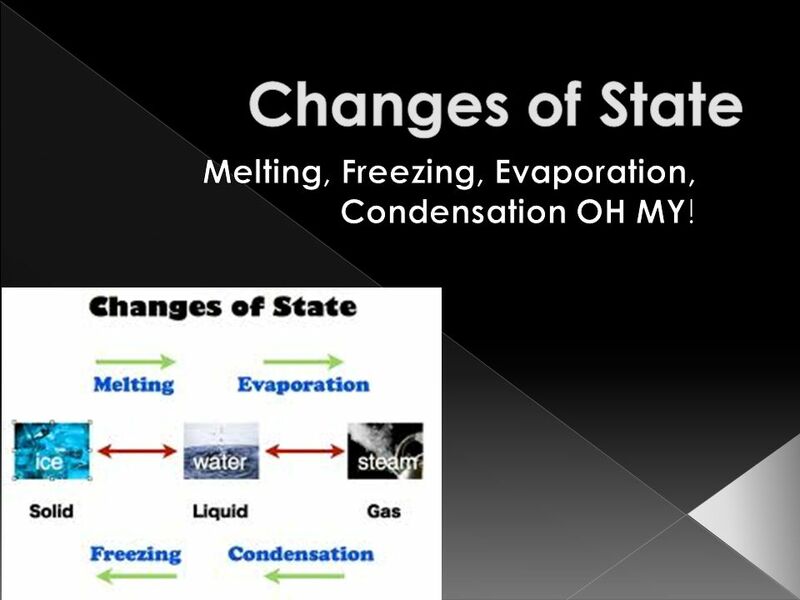 State Changes AKA= Phase Changes. 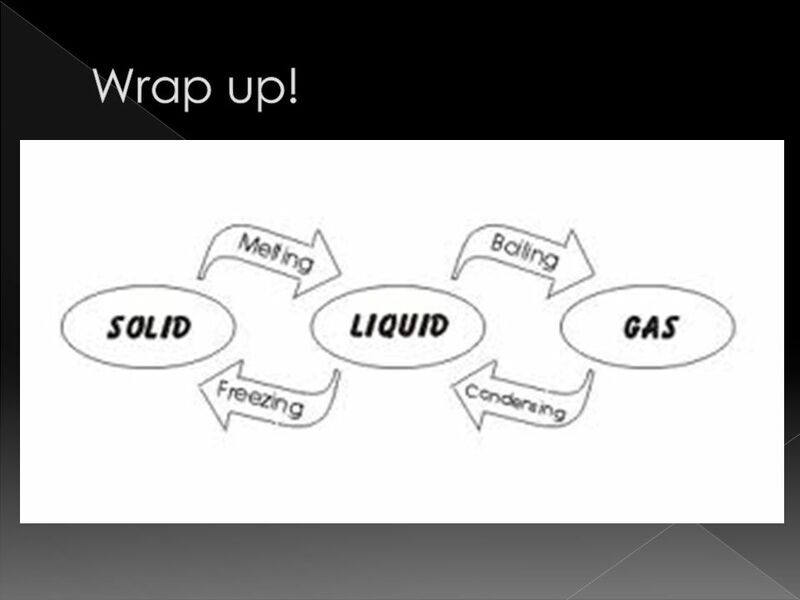 Review: 3 States of Matter Solid Liquid Gas. 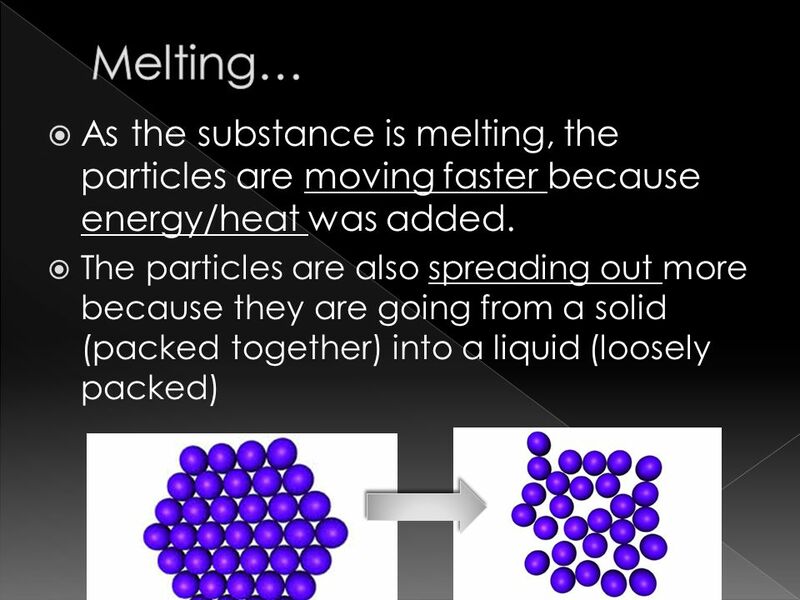 Phase Changes A change from one state of matter (solid, liquid, gas) to another. Physical change because appearance is changed, not chemical make-up; reversible. Changes of State Mrs. Andris. 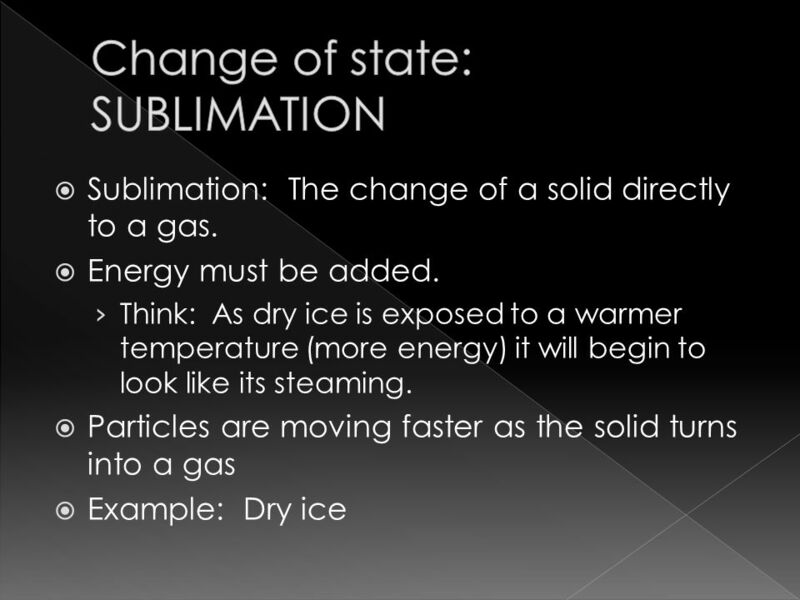 5 Changes of State Sublimation –Solid turns directly into a gas Condensation –Gas changes to a liquid Evaporation –Liquid. Phase Changes Melting Vaporization Condensation Freezing Sublimation. Kinetic Theory of Matter Matter is made up of vibrating particles Temperature A measure of how hot or cold a substance is a gain or loss of energy can. Picture 1. Picture 2 Picture 3 Picture 4 Picture 5. Changes of State All changes of state are physical changes, so the identity of the substance doesn’t change. 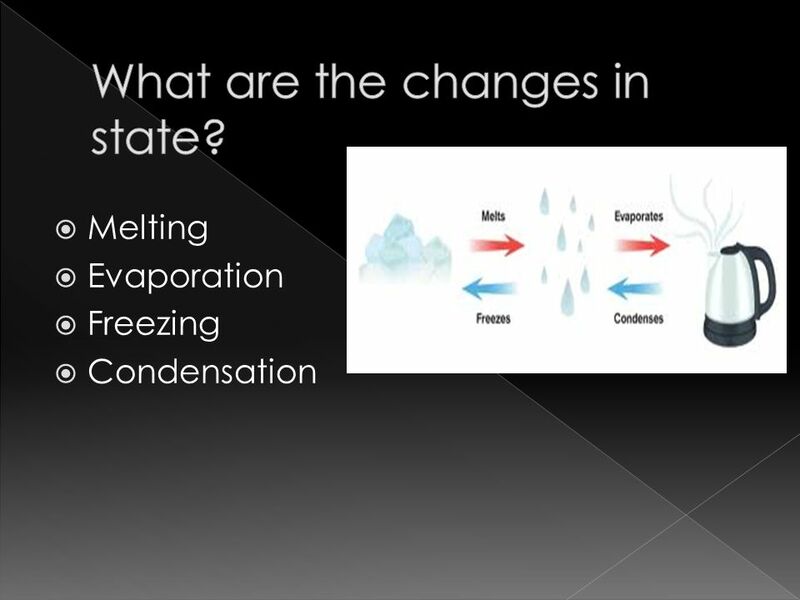 States of Matter and Phase Change. Phase Change Diagram. States of Matter Phase Change Trotter Phase Change Diagram. 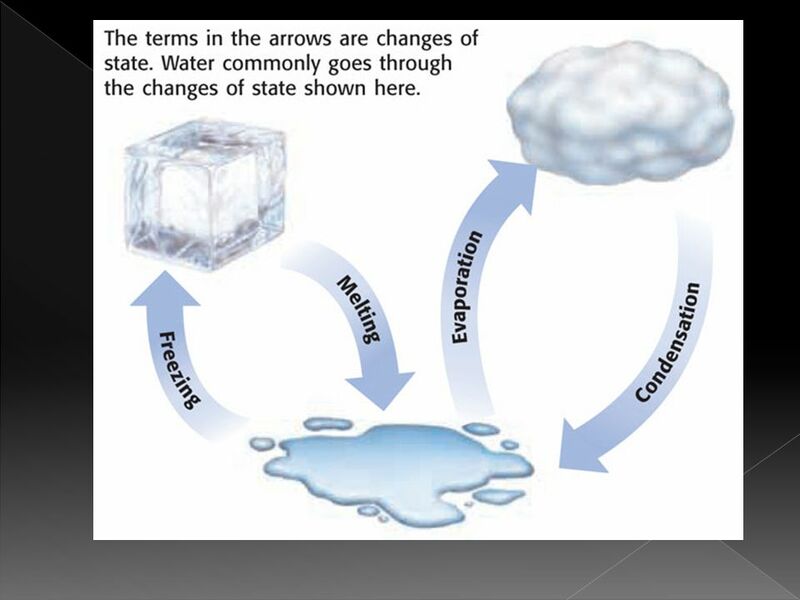 Changes of State Textbook pp A change of state is the conversion of a substance from one physical form to another. All changes of state are physical. 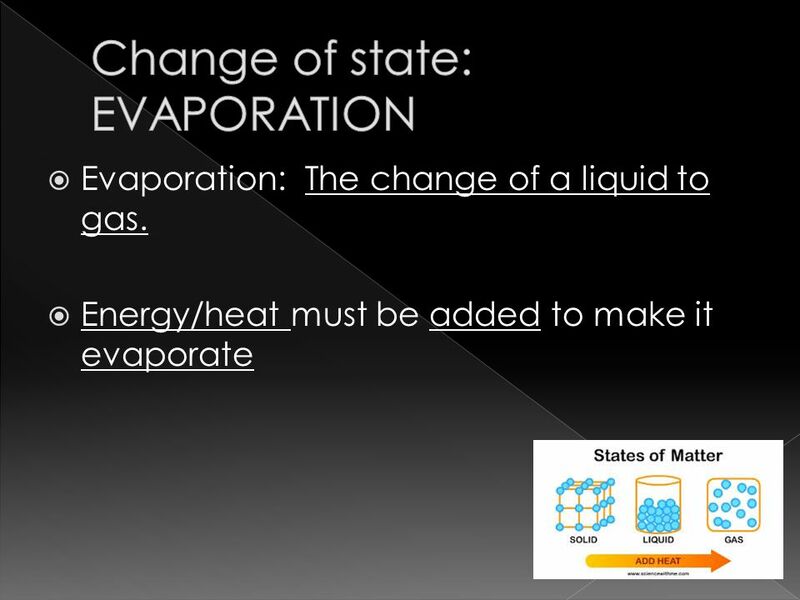 SECTION 2: CHANGES OF STATE Chapter 2: Solids, Liquids, and Gases.